This internet tutorial tells (and shows) you how to skillfully butcher a chicken in ten easy steps. Your instructor is Herrick Kimball, inventor of the world famous Whizbang Chicken Plucker. Please Note: This web site is a redux of my 2007 How-To-Butcher-A-Chicken web site, which had over 2 million page views! You will not find a more precise and thorough discussion of the chicken butchering process than is provided here. If you want to learn how to butcher a chicken, you’ve come to the right place. This tutorial provides you with a logical, step-by-step explanation of the process, and you will find plenty of great photos to go with the text . The pictures here were taken by my 13-year-old son, James Kimball, as we backyard-butchered our 2007 crop of home-raised Cornish-X meat birds. Our family has raised and processed 50 to 75 chickens each year for the past ten years. James learned at a young age how to process a fatted chicken. When he was eleven, he was killing, scalding, plucking, and gutting chickens, and doing a right good job of it! If an 11-year-old boy can do that, you can too. 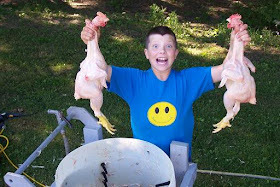 I have written a photo essay about James processing chickens, Here’s the link: Backyard Poultry Processing With My 11-Year-Old Son. Unlike James, I did not grow up learning to butcher poultry. I was a sissified suburban kid. It was not until I was 41 years old that I had my first chicken butchering experience, and it was stressful for me. I was, to be perfectly honest, grossed out by the whole thing. That is the typical modern reaction. 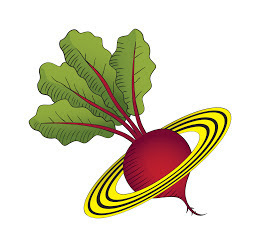 Most people these days have become so removed from the reality of food production. As a result, we are practically helpless at providing our own food. We depend on the Industrial Providers to supply us with chicken, and just about everything else we eat. In recent years I’ve come to realize that it is not necessarily a good thing to be so dependent, especially as food production has become so global. I want to become more food in dependent. When you grow your own food, it’s safer. It’s better for you. And it sure is a whole lot more satisfying. Unpleasant as butchering was, my desire to produce safe, wholesome, home-raised meat for my family was the incentive for me to stick with it. I was determined to not only learn how to process a chicken, but to become good at it. After 10 seasons of backyard poultry processing, I’ve gotten pretty good at it. And I’ve gotten faster at it too! It took me more than 40 minutes to dress my first chicken (and the finished product was truly slaughtered—in the worst sense of the word). Now, it typically takes me 5 to 7 minutes to gut and clean a chicken (and the finished bird looks pretty nice, if I don’t say so myself). I could go faster, but that is a comfortable pace for me. This blog will walk you through the whole process of dressing a chicken, one step at a time. Links to each step of the process are in the sidebar over on the right side of this page. I suggest you copy this guide and have it with you when you butcher your first chickens. Or, if you have a laptop computer, bring it outside and use it as a reference. Isn’t the internet great! We will begin with a freshly-plucked bird. To learn about things like killing, bleeding, scalding and plucking your chickens, I encourage you to check out the many FREE poultry-related internet photo essays I’ve written (Click Here). It is my hope that you will be encouraged and empowered by the information presented here; that you will raise your own wholesome chickens for meat, process them yourself, and discover the satisfaction that comes with achieving greater food self sufficiency. If you like this blog tutorial, I ask that you please let others know about it by posting links at your web sites, blogs, and other internet venues. And I thank you for that. My son, James, was a pro at 11-years old. If he can do it, so can you! Have You Been To the NEW Planet Whizbang?